This remarkable leave-in booster serum is the perfect addition to the RevivHair™ line in the battle against hair loss and a problem scalp. Targeted at reducing hair loss and encouraging new hair growth, it helps boost the development of healthy hair follicles, lessen thinning hair, strengthen fibers against breakage, and thicken existing hair strands for fuller-looking and thicker-feeling hair. This booster is designed to be used as an intensive treatment two to four times, or more, a year. With three novel, highly-stable, and highly-pure biomemetic peptides derived from bacterial fermentation which demonstrate uniquely proven mechanisms of action: they each have shown to stimulate de novo hair generation through the activation of WNT signals which in turn activates beta-catinin -Lef signals for hair growth. These are molecules proven to help reduce the rate of hair loss and help visibly maintain — and visibly increase — the density of thinning hair. Placode Serum's base compares to renowned Pantene® Expert Collection AgeDefy Advanced Thickening Treatment, Allure® Magazine's highly-coveted Best of Beauty™ award winner (more here), including proven thickeners Niacinamide, Caffeine, Panthenol and special polymers. We then leapfrog with triple novel biomemetic oligopeptides and Gold Award-winner Lecigel™. 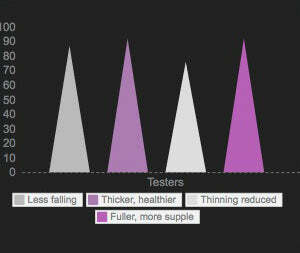 About the Chart: In a 60-day, 23-person consumer study of Placode Booster Serum, 87% of consumers tested noted a reduction in the appearance of falling hair, 92% agreed that their hair appeared thicker or healthier; 74% of testers also saw a reduction in the appearance of thinning scalp areas; 92% said their hair appeared fuller or more supple. About the Phototrichogram (representative sample): In a 90-day, 12-person consumer study (7 men; 5 women), an average 10.2% increase in the appearance of anagen hair; 22.8% decrease in the appearance of telogen hair; and an 8.3% increase in cumulative hair thickness. This very small amino acid chain produced by nonribosomal peptides synthesis (NRPS) has been shown to promote hair growth, and to help the appearance of hair depigmentation, and generally target the revitalization of follicles & supplied blood circulation. This peptide has shown to target the down-regulation 10 DKK-1 (Dickkopf1), a protein which can induce hair loss. It also targets new hair bulb cell proliferation and migration, and the strengthening of the follicle and shaft. It helps prevent hair damage caused by stress, UV exposure and other adverse environmental factors and nourishes the scalp and hair bulb roots. DKK1 is one of the most upregulated genes in androgen-potentiated balding, with the DKK-1 messenger RNA upregulated a few hours after D•HT treatment of hair follicles at the dermal papilla in vitro. It is shown to be a neutralizing body against DKK-1 reversed D•HT effects on outer root sheath keratinocytes. A stimulator of hair placode formation, this 10 amino acid chain peptide has been shown to generate de novo hair through the activation of the β-catenin signal which plays a key mechanism in differentiating hair follicle epithelial stem cells into hair keratinocyte cells. It has similar activities to natural occurring WNT10, and has much higher stability and skin penetration potency than natural-occurring WNT10. 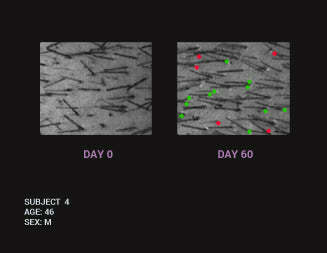 Shown to help activate the anagen (growth) phase and delay the catagen phase to inhibit hair loss. Providing a cooling and refreshing action for at least 20 minutes, this new award-winning ingredient is characterized by a unique sensorial, cool, soft and silky skin feel. Based on phospholipids — skin-identical "mortar" molecules — Lecigel™ is moisturizing and hydration-preserving, and also acts as a powerful delivery system to boost the bioavailability and penetration of active ingredients of the formula for faster and better results. Lecigel won the Gold Award for Best Functional Ingredient at the in-Cosmetics Asia global conclave last year. High-Strength Niacinamide, Caffeine, Panthenol (Provitamin B5), and Polymers. These ingredients have shown to strengthen hair, visibly thicken the hair shaft, and help hair become more supple. Placode Booster Serum is designed to work in tandem with the other remarkable products in the RevivHair™ line, so you can create a thicker, fuller haircare regimen to meet your individual needs. 1. Using your thumb, flick the orchid colored plastic cap up and off the metal band, and discard. 2. Lift the center tab of the metal band using your fingers, or use a pair of pliers, forceps, hemostat, or an equivalent tool. 3. Slowly peel back the tab. Continue pulling the tab down the side of the vial until the crimped metal seal is broken. Remove the metal seal and discard. 4. Gently lift and remove the rubber stopper. After use, return the rubber stopper to the vial. 1. Using the provided syringe applicator, draw 1 ml. 2. Apply 1 ml directly to scalp. Focus specifically on the most affected areas. Can be applied to either damp or dry scalp. Do not rinse out. 3. Massage the scalp with your fingertips, or use a dermaroller, to distribute the treatment. Optimal regimen: use a light pass of a demaroller both before, and after, application of the booster serum. 4. Return the stopper to the vial for subsequent use. Vial is good for 6 days of application. 5. Style hair as usual. After application, it may be useful to rinse the syringe applicator in lukewarm water to avoid any buildup of product. Recap syringe for next use. Apply 1 ml once daily for 30 days. Recommended frequency of Intensive Treatment: two to four times a year. More frequent application won't be detrimental, but may not produce better results. Apply to wet or dry scalp, before RevivHair Max Stimulating Serum or topicals such as minoxidil. If sensitivity occurs, reduce application initially to every other night until tolerance builds. Keep out of reach of children. For external use only. Do not swallow. In case of contact with eyes, rinse immediately with water. Gentle enough for color-treated hair. Quick-drying, light fresh scent. May be applied to beard area, in addition to scalp. Water/ Aqua/Eau, Alcohol Denat, Decapeptide-18 & Decapeptide-10 & Oligopeptide-54, Niacinamide, PEG/PPG-20/23 Dimethicone, Acrylates/C10-30 Alkyl Acrylate Crosspolymer, Sodium Acrylates Copolymer & Lecithin, Caffeine, Panthenol, Fragrance, Triethanolamine. Note from our legal eagles: Astonishing Developments Ltd. and its RevivSerums.com products, including its RevivHair Placode Booster Serum product, are neither affiliated with, nor approved by, Procter & Gamble, Inc., makers of Pantene® products. Other company and/or product names may be trade names, trademarks and/or registered trademarks of the respective owners with which they are associated. None of our products are intended for use in the cure, mitigation, treatment or prevention of disease and/or are not intended to affect the structure or any function of the human body. Any testimonials on this website are based on individual results, and do not constitute a guarantee that you will achieve the same results. Too soon to tell whether the booster will produce results (2 weeks in). Using it with the serum. Not expecting dramatic results tbh. Good product / liquid consistency, absorbs quickly into scalp. Hint #1) Use 0.9ml only, daily. If you use the full 1ml you'll probably only have 0.5ml left at each day 6 (each vial has 6ml). This may be explained by the product that attaches to the small seringe. Hint #2) Once opened, the rubber top of the vial will easily pop, so be sure not to travel by airplane with already opened vials (the differences in pressure will give you a bad suprise: the content will spill all over!). Thanks for the review, and the tips! Note that in actuality the individual 6 ml vials are purposefully overfilled just a bit. There is AT LEAST 6 ml in each vial, and in general about 6.15 ml. We overfill the vials because the product can cling to the inside of the glass container, making it appear that there is not enough product left on day 6. We recommend a complete daily dose of 1.0ml, but note the dosage doesn't need to be that exact. Regarding the travel issue, indeed the rubber stopper often doesn't seat completely after initial opening. If you'd like a travel vial container, just put a note in your shopping cart's 'Order Notes' box, the next time you order RevivHair Placode Booster Serum, and we'll be happy to supply a complimentary empty travel vial for your use that will travel better. I have been using the Placode Booster for one month and I see new hairs on my temples where I never had any. My hair fall has completely stopped too and my hair is a lot thicker. I'm also using the other Serum during the day. These products are a bit more expensive than minoxidil or other popular hair treatments but they sure are worth it because they work. I have been using for 6 weeks product is great. I have been using this serum once a day overnight for about 1.5 months. Although significant effects should be noticeable after at least 3-6 months, I have observed the following since the first application. My hair falls out drastically less during hair washing (I wash it every 3 days and did not change the shampoo). In addition, I can see small new hairs on my secret hairline corners which are my "problem zones". This I have never seen before with other hair growth products. My scalp has also been almost free of dandruff since I started using the serum. Because of these first positive effects, I will definitely continue to use the serum. The delivery to Germany was fast and without any problems. Thanks for that!